It’s easy to overlook familiar birds, but yesterday I noticed a Great Blue Heron that was poised in an unusual stance, with its head low to the water for a long period of time. On taking a closer look, I saw that it had some prey that was too big for it to handle. I grabbed my camera and snuck closer and closer, but the bird seemed so intent on its prey that it was oblivious to me. A Great Blue Heron tries to nab something out of the water. At first I thought it might have a big bullfrog, but then I realized it had a fish. The struggle went on, with the bird lifting the fish out of the water over and over, but never managing to gulp it down. This picture shows how big the fish was. 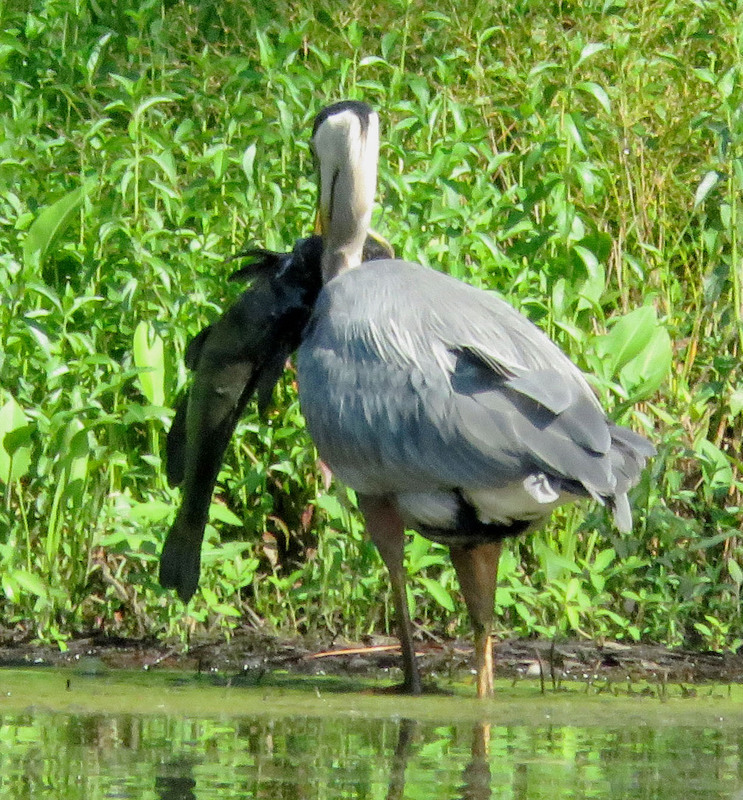 The fish looked way too huge for the heron to manage. Every now and then the bird would stand still as if debating if it should keep trying, and once it just ruffled all its feathers. After half an hour, the heron gave up and flew off. I ran around the pond to see the fish, and it was a catfish! So that is one observation verified. About a year and a half ago, I was out at night waiting for the super moon, and I saw some fish sleeping close to shore. Our pond is manmade and it should only have blue gill and large mouth bass in it, but these fish sure looked like catfish to me and to everyone I showed the pictures to. Some people say that birds bring in fish eggs on their legs and feathers, but supposedly scientists aren’t positive about that. I think this is a Blue Catfish. It measured at 14 inches, and 1.04 pounds. You can see the marks left on it by the heron. 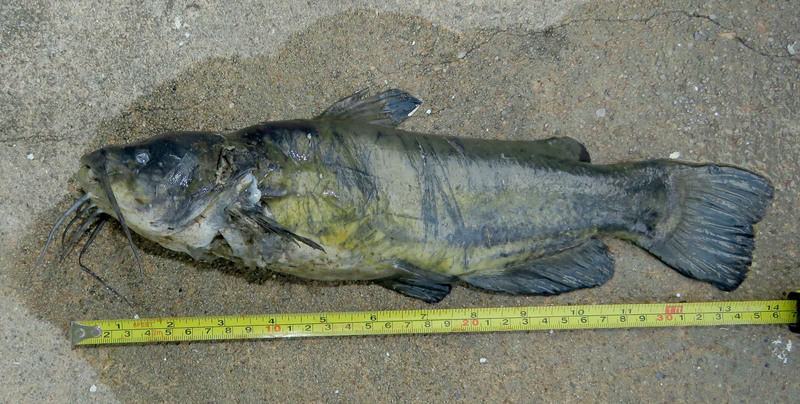 14 inch catfish (36 cm). 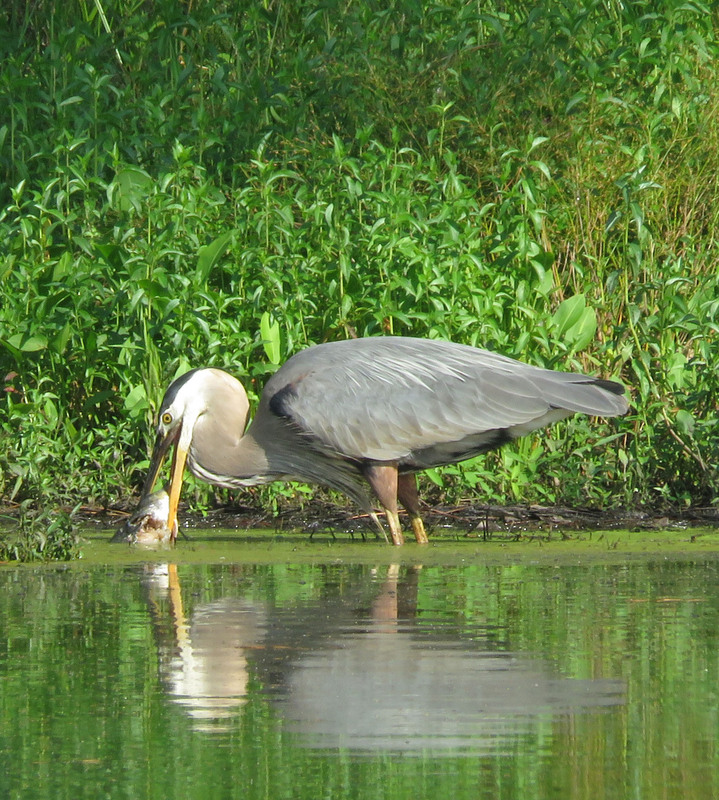 The catfish caught by the heron. Back in March, I saw a similar match-up between a Great Blue and a fish. 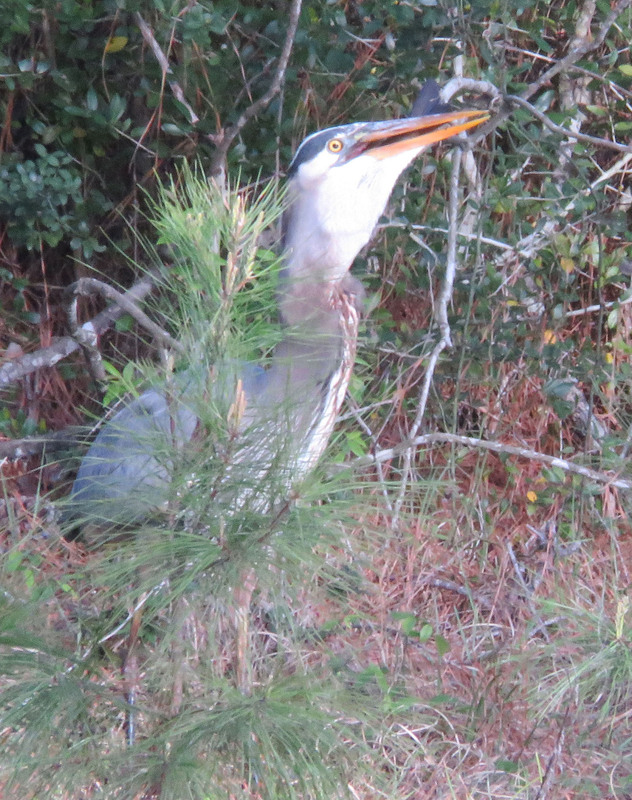 The fish looked just as big as this one, and the Great Blue carried it way up on the bank. 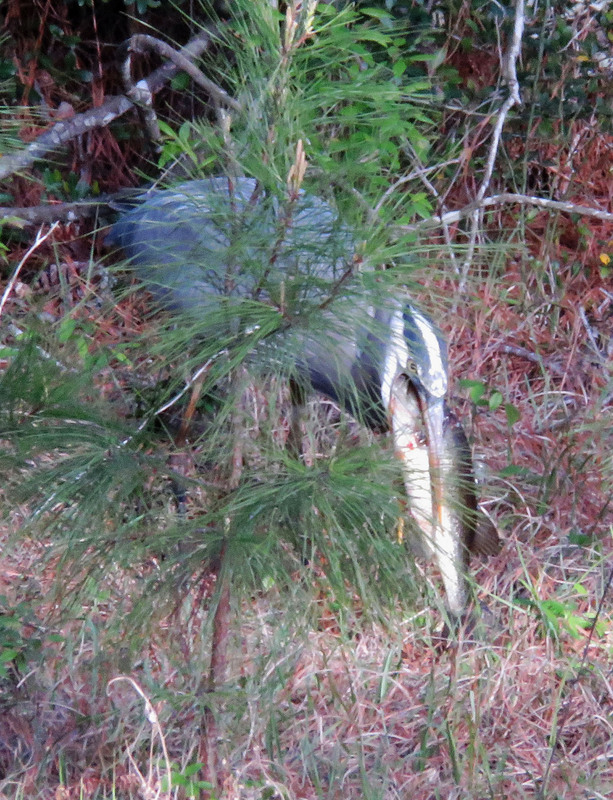 The fish escaped a couple of times, but in the end, the Great Blue got its dinner. A Great Blue Heron weighs about 5.3 pounds, or 2400 grams. It’s amazing to think of it being able to eat something that weighs about a fifth of its own weight — all in one gulp — and then being able to just fly off as usual! Good grief! My mom always said to take smaller bites. I’m pretty sure he was swearing in Heronese too. Not very nice manners. What an incredible series of images.. you are a very patient lady to capture all of these. I kept asking my Dad how could they eat so much and still fly…the only answer I ever got, accompanied by a laugh, was ‘you had better ask the pelican, because his beak can hold more than his belly can’. I still love pelicans.. majestic birds. I love them too. I have seen them flying in formation, but I have never seen them catch a fish! That would be amazing! 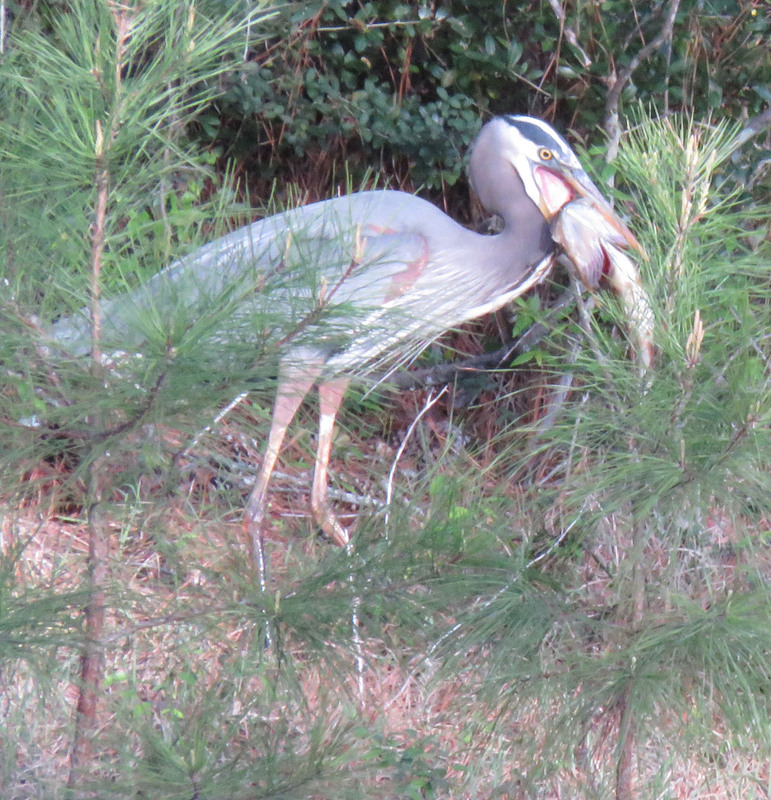 Wow, that Blue Heron was determined to get that fish….I’m amazed that it actually left the fish. I don’t believe they have the capability to eat parts of fish. Have watched one we have down at creek and they always eat their meals whole! You did a great job at capturing these photos. Gayle, sorry for the late reply! I think you are right that they always eat their meals whole. I think this poor bird really didn’t know what to do since it couldn’t lift the fish high enough to get a good gulp, it was quite the dilemma.